Image | This entry was posted in Core Collection. Bookmark the permalink. Never liked flannel shirts and certainly had little time for music the was exemplified by them. Echorich – The 90s were a time I will never want to revisit musically! The first time was bad enough. Now I’m too old for hipster nostalgia! 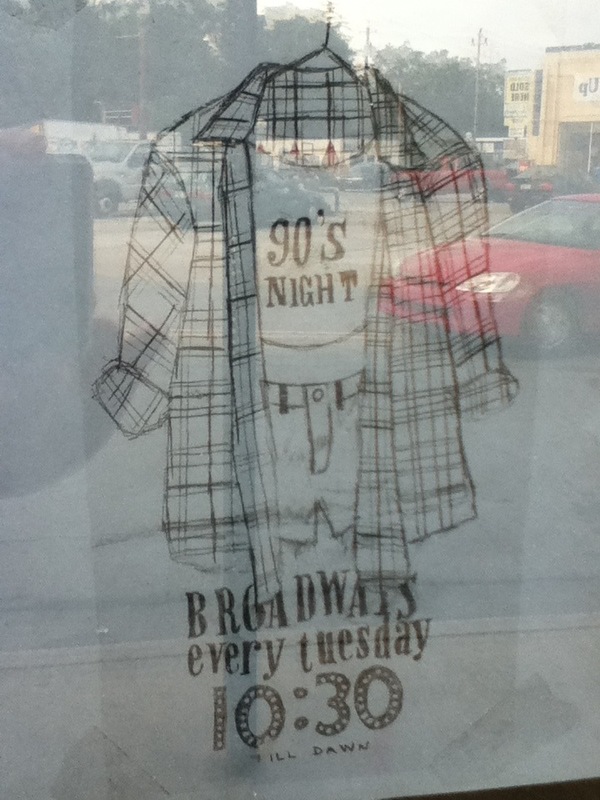 First New Wave Nights became 80s Night, which was something I was pretty ambivalent about. And now this. Step right up and please take care to avoid the whirling blades! This is the best thing about the early 90’s” the music was so gawdawful that I hardly bought much of anything new and in this sonic wasteland I started to listen sideways to the people that influenced 80’s bands that I liked and started to listen backward from that. The range of music that I enjoy expanded in a huge way because of this and quite honestly I listen to the music that I discovered during this span more than I listen to a lot of the former post punk/new wave bands that I liked so much in the 80’s. Great point Tim. I found a love of all things 70’s Motorik in the 90’s thanks to that decade’s sonic wasteland. But maybe that’s a bit strong. By the end of the 80’s House music had become a focus for me and that took me well into the 90’s. I spent 10 to 1 vinyl 12″ house mixes to Rock or Pop cd’s. I did follow artist’s from the 80’s into the 90’s, but they were few. Echorich – The 90s is when I gave up on contemporary and sowed the seeds that have ultimately resulted in this blog. On occasion, it vexes me that I’m no longer contemporary in my tastes, but I tried for several years and had nothing but an increasingly bad mood to show for it. The ten year death march from 1983 to 1993 was a time of increasing musical draught where I simply got less and less nutrients from the sonic soil.Something had to give. The spark that lit the flame was finally hearing The Associates ten years too late! If I had missed this, what else was in my rear view mirror?! Tim – Interesting. I wonder if you mean artists that were prime influences like Bowie and Roxy or the bands that in turn, influenced them; Lou Reed, Scott Walker, Can, Neu!? I rise in defense of the 90s, m’lud! Sure, there was a lot of crap there, but hey, news flash: it was ever thus! We gold-digger types went around pulling the needles out of the haystacks of dreck, just as we had in the 70s! The early 90s in particular saw the rise of a lot of great indie bands, such as the Trashcan Sinatras, They Might Be Giants (technically a late-80s band, but the 90s was their best period — there were a lot of bands like that), Mazzy Star, Stone Roses, Bad Religion, Belle & Sebastian, The Beautiful South, Chumbawumba, The Connells, Inspiral Carpets, Komeda, The Lightning Seeds, The Magnetic Fields, The Mission (UK), Morrissey’s solo career (I know the Monk and I disagree on the quality of Morrissey’s music, but I like most of it), Neutral Milk Hotel, The Origin, The Other Two, St. Etienne, The Sundays, The Toasters, and of course … John Foxx Mk II! If you throw in bands that got started late in the 80s but made it big (or were at their peak) in the 90s, the list above doubles in size. I hated grunge music or whatever the dominant style was of the 90s like most people here, but having worked in college radio at the time I can’t write off the entire decade, there was LOTS of great music (mostly being made by the more interesting 80s artists, but still) released in that decade.